After a hiatus of six long years, US astronauts will finally launch to space in a revolutionary new pair of private crew capsules under development by Boeing and SpaceX, starting in 2017, that will end our sole source reliance on the Russians for launching our astronauts to the International Space Station (ISS). Two years from now, crews will start flying to space aboard the first US commercial spaceships, launching atop US rockets from US soil, said officials from Boeing, SpaceX, and NASA at a joint news conference on Monday, Jan. 26. 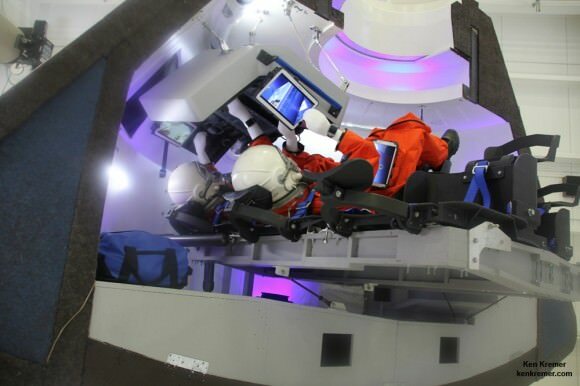 The human rated spaceships – also known as “space taxis” – are being designed and manufactured under the auspices of NASA’s Commercial Crew Program (CCP). A two person mixed crew of NASA astronauts and company test pilots will fly on the first test flights going to the space station in 2017. The goal of NASA’s Commercial Crew Program, underway since 2010, has been to develop safe, reliable, and cost-effective spaceships that will ferry astronauts to and from the massive orbiting lab complex. “It’s an incredible testament to American ingenuity and know-how, and an extraordinary validation of the vision we laid out just a few years ago as we prepared for the long-planned retirement of the space shuttle,” said NASA Administrator Charlie Bolden during the briefing at the agency’s Johnson Space Center in Houston. Bolden is a four time veteran space shuttle astronaut. However – severe budget cuts by Congress forced NASA into a two year delay in the first commercial crew flights from 2015 to 2017 – and also forced NASA to pay hundreds of millions of more dollars to the Russians for crews seats instead of employing American aerospace workers. On Sept. 16, 2014, Administrator Bolden announced that Boeing and SpaceX had won the high stakes and history making NASA competition to build the first ever private “space taxis” to launch American and partner astronauts to the ISS and restore America’s capability to launch our crews from American soil for the first time since 2011. During the Sept. 16 briefing at the Kennedy Space Center, Bolden announced at that time that contracts worth a total of $6.8 Billion were awarded to Boeing to build the manned CST-100 and to SpaceX to build the manned Dragon V2. Boeing was awarded the larger share of the crew vehicle contract valued at $4.2 Billion while SpaceX was awarded a lesser amount valued at $2.6 Billion. 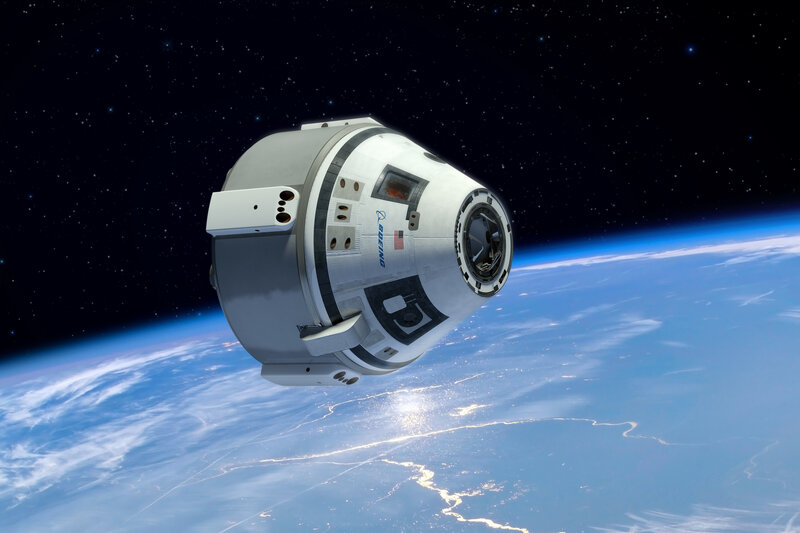 For extensive further details about Boeing’s CST-100 manned capsule, be sure to read my exclusive 2 part interview with Chris Ferguson, NASA’s final shuttle commander and now Boeing’s Commercial Crew Director: here and here. And read about my visit to the full scale CST-100 mockup at its manufacturing facility at KSC – here and here. But the awards were briefly put on hold when the third bidder, Sierra Nevada Corp, protested the decision and thereby prevented NASA from discussing the awards until the issue was resolved by the General Accounting Office (GAO) earlier this month in favor of NASA. Everyone involved is now free to speak about the awards and how they were decided. Each company must successfully achieve a set of 10 vehicle and program milestones agreed to with NASA, as well as meeting strict certification and safety standards. “There are launch pads out there already being upgraded and there is hardware already being delivered,” said Kathy Lueders, manager of the Kennedy Space Center-based Commercial Crew Program. Every American astronaut has been totally reliant on the Russians and their three person Soyuz capsules for seats to launch to the ISS since the forced retirement of NASA’s Space Shuttle program in July 2011 following the final blastoff of orbiter Atlantis on the STS-135 mission. Under the latest crew flight deal signed with Roscosmos [the Russian Federal Space Agency], each astronaut seat costs over $70 million. “I don’t ever want to have to write another check to Roscosmos after 2017, hopefully,” said Bolden. Under NASA’s commercial crew contracts, the average cost to fly US astronauts on the Dragon and CST-100 is $58 million vs. over $70 million on the Russian Soyuz. At the briefing, Bolden indicated he was hopeful Congress would be more supportive of the program in the coming 2016 budget cycle than in the past that has already resulted in a 2 year delay in the first flights. “Congress has started to understand the critical importance of commercial crew and cargo. They’ve seen, as a result of the performance of our providers, that this is not a hoax, it’s not a myth, it’s not a dream,” said Bolden. The first unmanned test flights of the SpaceX Dragon V2 and Boeing CST-100 could take place by late 2016 or early 2017 respectively. Manned flights to the ISS would follow soon thereafter by the spring and summer of 2017. Boeing’s plans for the CST-100 involve conducting a pad abort test in February 2017, followed by an uncrewed orbital flight test in April 2017, and then a crewed flight with a Boeing test pilot and a NASA astronaut in July 2017, as outlined at the briefing by John Elbon, vice president and general manager of Boeing’s Space Exploration division. SpaceX’s plans for the Dragon V2 were outlined by Gwynne Shotwell, president of SpaceX. “The Dragon V2 builds on the cargo Dragon. First up is a pad abort in about a month [at Cape Canaveral], then an in-flight abort test later this year [at Vandenberg to finish up development work from the prior CCiCAP phase],” said Shotwell. The Boeing CST-100 will launch atop a human rated United Launch Alliance Atlas V rocket from Space Launch Complex 41 on Cape Canaveral Air Force Station, FL. The SpaceX Dragon will launch atop a human rated Falcon 9 v1.1 rocket from neighboring Space Launch Complex 40 at the Cape. NASA told two companies to halt work on the next phase of its commercial crew program — the spacecraft expected to replace Russian ones ferrying astronauts to the International Space Station — because of a protest related to the contract award, according to media reports. 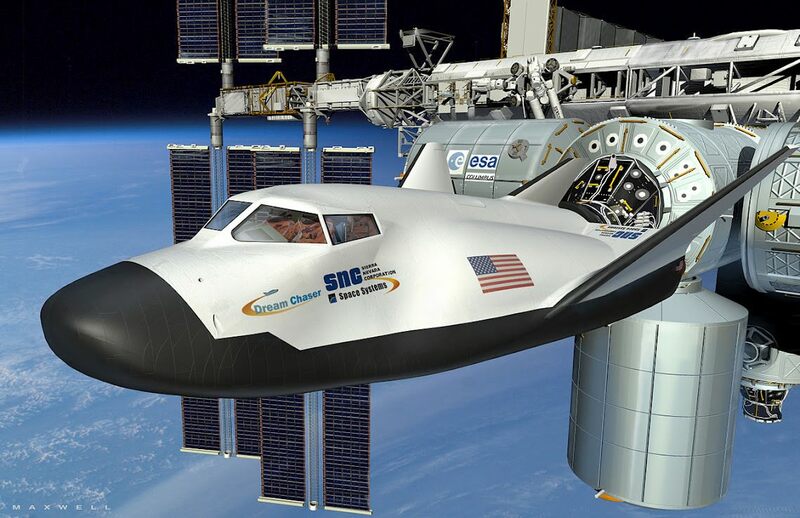 Sierra Nevada Corp. (SNC) filed a complaint on Sept. 26, shortly after its Dream Chaser shuttle-like design was not selected for further funding under the Commercial Crew Transportation Capability (CCtCap) phase of the program. Competitors SpaceX and Boeing each received billions of dollars for further development for their Dragon and CST-100 spacecraft, which are expected to start flying around 2017. A Spaceflight Now report, quoting NASA spokesperson Stephanie Schierholz, said the agency told both selectees that they must “stop performance of the CCtCap contract” pending the result of the challenge, which is before the Government Accountability Office. The office’s deadline for a response is Jan. 5, the report said. NASA administrator Charles Bolden declined to comment on the situation last week in response to questions from reporters at the International Astronautical Congress in Toronto, Canada, citing the legal situation. KENNEDY SPACE CENTER, FL – On Monday, June 9, Boeing revealed the design of their CST-100 astronaut spaceliner aimed at restoring Americas ability to launch our astronauts to low-Earth orbit (LEO) and the International Space Station (ISS) by 2017. The full scale CST-100 mockup was unveiled at an invitation only ceremony for Boeing executives and media held inside a newly renovated shuttle era facility at the Kennedy Space Center where the capsule would start being manufactured later this year. Universe Today was invited to tour the capsule for a first hand inspection of the CST-100’s interior and exterior and presents my photo gallery here. The CST-100 is a privately built manrated capsule being developed with funding from NASA under the auspices of the agency’s Commercial Crew Program (CCP) in a public/private partnership between NASA and private industry. The vehicle will be assembled inside the refurbished processing hangar known during the shuttle era as Orbiter Processing Facility-3 (OPF-3). Boeing is leasing the site from Space Florida. Boeing is one of three American aerospace firms vying for a NASA contract to build an American ‘space taxi’ to ferry US astronauts to the space station and back as soon as 2017. The SpaceX Dragon and Sierra Nevada Dream Chaser are also receiving funds from NASA’s commercial crew program. NASA will award one or more contracts to build Americas next human rated spaceship in August or September. Since the forced shutdown of NASA’s Space Shuttle program following its final flight in 2011, US astronauts have been 100% dependent on the Russians and their cramped but effective Soyuz capsule for rides to the station and back – at a cost exceeding $70 million per seat. Chris Ferguson, the final shuttle commander for NASA’s last shuttle flight (STS-135) now serves as director of Boeing’s Crew and Mission Operations. Ferguson and the Boeing team are determined to get Americans back into space from American soil with American rockets. Read my exclusive, in depth one-on-one interviews with Chris Ferguson – America’s last shuttle commander – about the CST-100; here and here. The vehicle includes five recliner seats, a hatch and windows, the pilots control console with several attached Samsung tablets for crew interfaces with wireless internet, a docking port to the ISS and ample space for 220 kilograms of cargo storage of an array of equipment, gear and science experiments depending on NASA’s allotment choices. The interior features Boeing’s LED Sky Lighting with an adjustable blue hue based on its 787 Dreamliner airplanes to enhance the ambience for the crew. The reusable capsule will launch atop a man rated United Launch Alliance (ULA) Atlas V rocket. Stay tuned here for Ken’s continuing Boeing, SpaceX, Orbital Sciences, commercial space, Orion, Curiosity, Mars rover, MAVEN, MOM and more planetary and human spaceflight news. 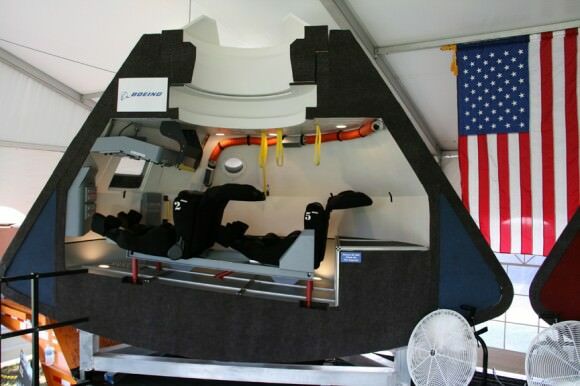 Boeing unveiled full scale mockup of their commercial CST-100 ‘Space Taxi’ on June 9, 2014 at its intended manufacturing facility at the Kennedy Space Center in Florida. The private vehicle will launch US astronauts to low Earth orbit and the ISS from US soil. KENNEDY SPACE CENTER, FL – Boeing unveiled a full scale mockup of their CST-100 commercial ‘space taxi’ on Monday, June 9, at the new home of its future manufacturing site at the Kennedy Space Center located inside a refurbished facility that most recently was used to prepare NASA’s space shuttle orbiters for missions to the International Space Station (ISS). 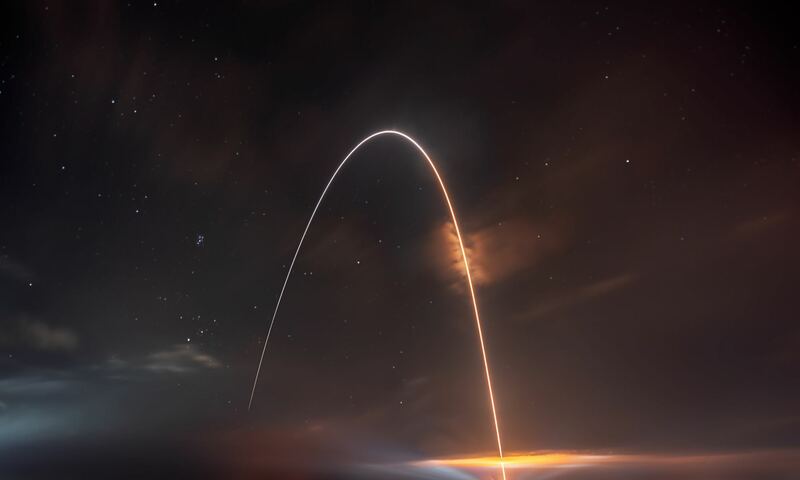 The overriding goal is restart our country’s capability to reliably launch Americans to space from US territory as rapidly and efficiently as possible. The CST-100 crew transporter was revealed at an invitation only ceremony and media event held on Monday, June 9, inside the gleaming white and completely renovated NASA processing hangar known as Orbiter Processing Facility-3 (OPF-3) – and attended by Universe Today. The huge 64,000 square foot facility has sat dormant since the shuttles were retired following their final flight in July 2011 and which was commanded by Chris Ferguson, who now serves as director of Boeing’s Crew and Mission Operations. Universe Today was invited to be on location at KSC for the big reveal ceremony headlining US Senator Bill Nelson (FL) and Boeing executives including shuttle commander Ferguson, for a first hand personal inspection of the private spaceship and also to crawl inside and sit in the seats of the capsule designed to carry American astronauts to the High Frontier as soon as 2017. The purpose of developing and building the private CST-100 human rated capsule is to restore America’s capability to ferry astronauts to low-Earth orbit and the space station from American soil aboard American rockets, and thereby end our total dependency on the Russian Soyuz capsule for tickets to space and back. Boeing’s philosophy is to make the CST-100 a commercial endeavor, as simple and cost effective as possible in order to quickly kick start US human spaceflight efforts. It’s based on proven technologies drawing on Boeing’s 100 year heritage in aviation and space. So the CST-100 is basically a taxi up and a taxi down from LEO. NASA’s complementary human space flight program involving the Orion crew vehicle is designed for deep space exploration. The stairway to America’s future human access to space is at last literally taking shape from coast to coast. Sen. Nelson, a strong space exploration advocate for NASA and who also flew on a space shuttle mission on Columbia back in January 1986, was the first person to climb the steps and enter the hatch leading to Boeing’s stairway to the heavens. “This is harder to get in than the shuttle. 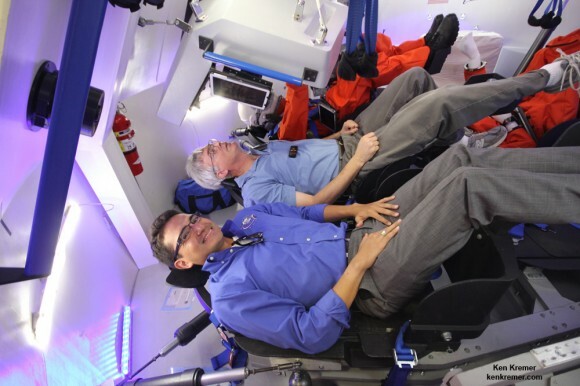 But the seats are comfortable,” Nelson told me as he climbed inside the capsule and maneuvered his way into the center co-pilots seat. Nelson received a personal guided tour of the CST-100 spaceship from Ferguson. The capsule measures 4.56 meters (175 inches) in diameter. 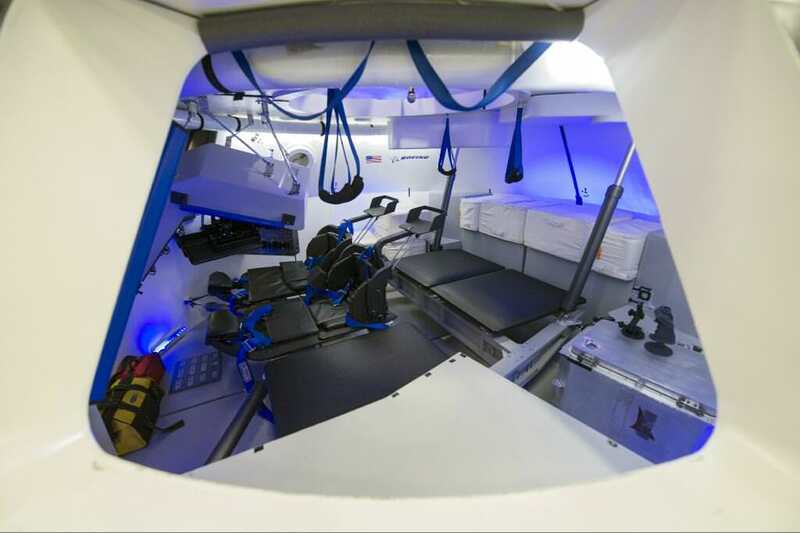 The media including myself were also allowed to sit inside the capsule and given detailed briefings on Boeing ambitious plans for building a simple and cost effective astronaut transporter. Boeing is among a trio of American aerospace firms, including SpaceX and Sierra Nevada Corp, vying for the next round of contracts to build America’s ‘space taxi’ in a public/private partnership with NASA using seed money under the auspices of the agency’s Commercial Crew Program (CCP). Since 2010, NASA has spent over $1.5 billion on the commercial crew effort. Boeing has received approximately $600 million and is on target to complete all of NASA’s assigned CCP milestones in the current contract phase known as Commercial Crew Integrated Capability initiative (CCiCAP) by mid-2014. 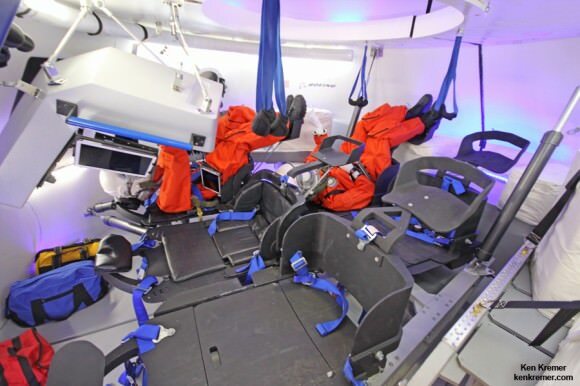 Boeing’s CST-100 crew capsule reveal on June 9 comes just two weeks after SpaceX CEO Elon Musk’s Hollywoodesqe glitzy live show on May 29 – pulling the curtain off his firms ‘Dragon’ crew vehicle entry into NASA’s commercial crew program. NASA officials say that the next round of contracts aims at building a human rated flight vehicle to dock at the ISS by late 2017. The next contract phase known as Commercial Crew Transportation Capability (CCtCap) will result in one or more awards by NASA later this summer around August or September . Sen. Nelson expressed his hope that the competition will continue since Congress appears likely to finally approve something near the President’s CCP funding request of over $800 million in the Fiscal 2015 NASA budget. NASA had hoped to fly the first commercial crew missions in mid-2015. But repeated CCP funding cuts by Congress since its inception in 2010 has already caused significant delays to the start of the space taxi missions for all three companies contending for NASA’s commercial crew contracts. In fact the schedule has slipped already 18 months to the right compared to NASA’s initial plans thus forcing the agency to buy more Soyuz seats from the Russians at a cost of over $70 million each. It was glorious to be seated inside America’s next spaceship destined to carry humans. The next generation of US human spaceflight is finally coming to fruition after a long down time. Read my exclusive new interview with NASA Administrator Charles Bolden explaining the importance of getting Commercial Crew online to expand our reach into space- here. NASA GODDARD SPACE FLIGHT CENTER, MD – Why is NASA’s Commercial Crew Program to develop private human transport ships to low Earth orbit important? That’s the question I posed to NASA Administrator Charles Bolden when we met for an exclusive interview at NASA Goddard. The Commercial Crew Program (CCP) is the critical enabler “for establishing a viable orbital infrastructure” in the 2020s, NASA Administrator Charles Bolden told Universe Today in an exclusive one-on-one interview at NASA’s Goddard Space Flight Center in Greenbelt, Md. Bolden, a Space Shuttle commander who flew four time to space, says NASA wants one of the new American-made private crewed spaceships under development by SpaceX, Boeing and Sierra Nevada – with NASA funding – to be ready to ferry US astronauts to the International Space Station (ISS) and back to Earth by late 2017. Flights for other commercial orbital space ventures would follow later and into the next decade. Since the shutdown of NASA’s space shuttle program following the final flight by STS-135 in 2011 (commanded by Chris Ferguson), America has been 100% dependent on the Russians to fly our astronauts to the space station and back. “Commercial crew is critical. We need to have our own capability to get our crews to space,” Bolden told me, during a visit to the NASA Goddard cleanroom with the agency’s groundbreaking Magnetospheric Multiscale (MMS) science probes. Administrator Bolden foresees a huge shift in how the US will conduct space operations in low earth orbit (LEO) just a decade from now. The future LEO architecture will be dominated not by NASA and the ISS but rather by commercial entrepreneurs and endeavors in the 2020s. “There are going to be other commercial stations or other laboratories,” Bolden excitedly told me. And the cash strapped Commercial Crew effort to build new astronaut transporters is the absolutely essential enabler to get that exploration task done, he says. Bolden and NASA are already looking beyond the ISS in planning how to use the new commercial crew spaceships being developed by SpaceX, Boeing and Sierra Nevada in a public- partnership with NASA’s Commercial Crew Program. Private NewSpace ventures represent a revolutionary departure from current space exploration thinking. But none of these revolutionary commercial operations will happen if we don’t have reliable and cost effective human access to orbit from American soil with American rockets on American spaceships. “We need to have our own capability to get our crews to space – first of all. That’s why commercial crew is really, really, really important,” Bolden emphasized. The ongoing crises in Ukraine makes development of a new US crew transporter to end our total reliance on Russian spaceships even more urgent. “So we just keep watching what’s going on in other places in the world, but we continue to work with Roscosmos the way we always have,” Bolden stated. The latest example is this week’s successful launch of the new three man Russian-US- German Expedition 40 crew to the ISS on a Soyuz. Of course, the speed at which the US develops the private human spaceships is totally dependent on the funding level for the Commercial Crew program. Unfortunately, progress in getting the space taxis actually built and flying has been significantly slowed because the Obama Administration CCP funding requests for the past few years of roughly about $800 million have been cut in half by a reluctant US Congress. Thus forcing NASA to delay the first manned orbital test flights by at least 18 months from 2015 to 2017. And every forced postponement to CCP costs US taxpayers another $70 million payment per crew seat to the Russians. As a result of the congressional CCP cuts more than 1 Billion US Dollars have been shipped to Russia instead of on building our own US crew transports – leaving American aerospace workers unemployed and American manufacturing facilities shuttered. I asked Bolden to assess NASA’s new funding request for the coming fiscal year 2015 currently working its way through Congress. “It’s looking better. It’s never good. But now it’s looking much better,” Bolden replied. The pace of progress in getting our crews back to orbit basically can be summed up in a nutshell. “No Bucks, No Buck Rogers,” Chris Ferguson, who now leads Boeing’s crew effort, told me in a separate exclusive interview for Universe Today. The Boeing CST-100, Sierra Nevada Dream Chaser and SpaceX Dragon ‘space taxis’ are all vying for funding in the next round of contracts to be awarded by NASA around late summer 2014 known as Commercial Crew Transportation Capability (CCtCap). All three company’s have been making excellent progress in meeting their NASA mandated milestones in the current contract period known as Commercial Crew Integrated Capability initiative (CCiCAP) under the auspices of NASA’s Commercial Crew Program. Altogether they have received more than $1 Billion in NASA funding under the current CCiCAP initiative. Boeing and SpaceX were awarded contracts worth $460 million and $440 million, respectively. Sierra Nevada was given what amounts to half an award worth $212.5 million. SpaceX CEO Elon Musk just publicly unveiled his manned Dragon V2 spaceship on May 29. Boeing’s Chris Ferguson told me that assembly of the CST-100 test article starts soon at the Kennedy Space Center. NASA officials have told me that one or more of the three competitors will be chosen later this year in the next phase under CCtCAP to build the next generation spaceship to ferry astronauts to and from the ISS by 2017. Concurrently, NASA is developing the manned Orion crew vehicle for deep space exploration. The state-of-the-art capsule will carry astronauts back to the Moon and beyond on journeys to Asteroids and one day to Mars. “We need to have our own capability to get our crews to space. Commercial Crew is critical to establishing the low Earth orbit infrastructure that is required for exploration,” that’s the bottom line message from my interview with NASA Administrator Bolden. KENNEDY SPACE CENTER, FL – Boeing expects to begin “assembly operations of our commercial CST-100 manned capsule soon at the Kennedy Space Center,” Chris Ferguson, commander of NASA’s final shuttle flight and now director of Boeing’s Crew and Mission Operations told Universe Today in an exclusive one-on-one interview about Boeing’s space efforts. In part 1, Ferguson described the maiden orbital test flights to the ISS set for 2017 – here. In part 2, we focus our discussion on Boeings’ strategy for building and launching the CST-100 ‘space taxi’ as a truly commercial space endeavor. To begin I asked; Where will Boeing build the CST-100? During the shuttle era, all three of NASA’s Orbiter Processing Facilities (OPFs) were a constant beehive of activity for thousands of shuttle workers busily refurbishing the majestic orbiters for their next missions to space. But following Ferguson’s final flight on the STS-135 mission to the ISS in 2011, NASA sought new uses for the now dormant facilities. So Boeing signed a lease for OPF-3 with Space Florida, a state agency that spent some $20 million modernizing the approximately 64,000 square foot hanger for manufacturing by ripping out all the no longer needed shuttle era scaffolding, hardware and equipment previously used to process the orbiters between orbital missions. 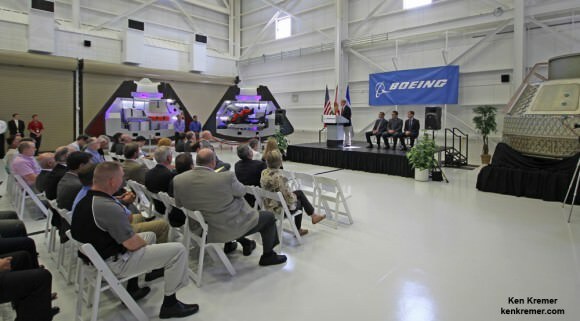 Boeing takes over the OPF-3 lease in late June 2014 following an official handover ceremony from Space Florida. Assembly begins soon thereafter. When will CST-100 spacecraft manufacturing begin? “The pieces are coming one by one from all over the country,” Ferguson explained. “Parts from our vendors are already starting to show up for our test article. 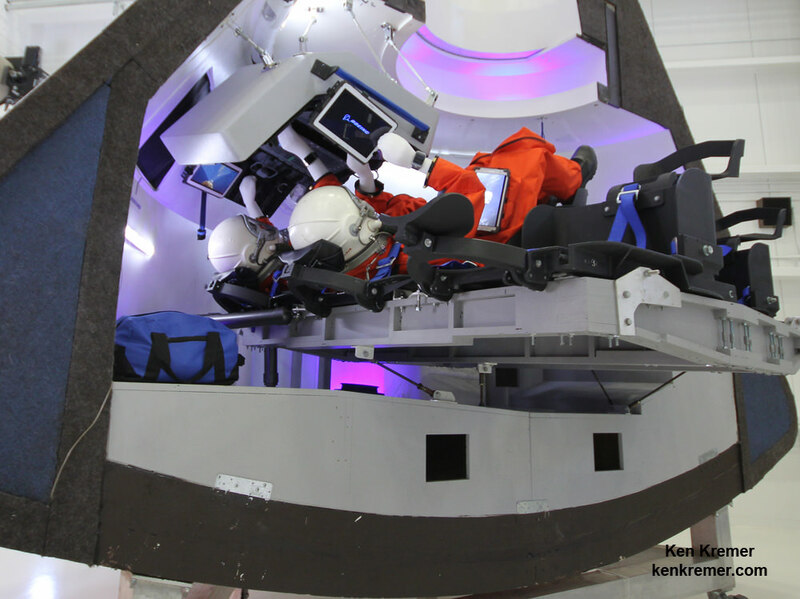 The CST-100 is being designed at Boeing’s Houston Product Support Center in Texas. It is a reusable capsule comprised of a crew and service module that can carry a mix of cargo and up to seven crew members to the International Space Station (ISS) and must meet stringent safety and reliability standards. How will the pressure vessel be manufactured? Will it involve friction stir welding as is the case for NASA’s Orion deep space manned capsule? “There are no welds,” he informed. Spincraft has extensive space vehicle experience building tanks and assorted critical components for the shuttle and other rockets. The capsule measures approximately 4.56 meters (175 inches) in diameter. The combined crew and service modules are about 5.03 meters (16.5 feet) in length. “In two years in 2016, our CST-100 will look like the Orion EFT-1 capsule does now at KSC, nearly complete [and ready for the maiden test flight]. Orion is really coming along,” Ferguson beamed while contemplating a bright future for US manned spaceflight. He is saddened that it’s been over 1000 days since his crew’s landing inside shuttle Atlantis in July 2011. With Boeing’s long history in aircraft and aerospace manufacturing, the CST-100 is being designed and built as a truly commercial endeavor. Therefore the spacecraft team is able to reach across Boeing’s different divisions and diverse engineering spectrum and draw on a vast wealth of in-house expertise, potentially giving them a leg up on commercial crew competitors like SpaceX and Sierra Nevada Corp. Nevertheless, designing and building a completely new manned spaceship is a daunting task for anyone. And no country or company has done it in decades. How hard has this effort been to create the CST-100? – And do it with very slim funding from NASA and Boeing. “Well any preconceived notion I had on building a human rated spacecraft has been completely erased. This is really hard work to build a human rated spacecraft!” Ferguson emphasized. Read more about the travails of NASA’s commercial crew funding situation in Part 1. The team size now is just a fraction of what it was for past US crewed spaceships. 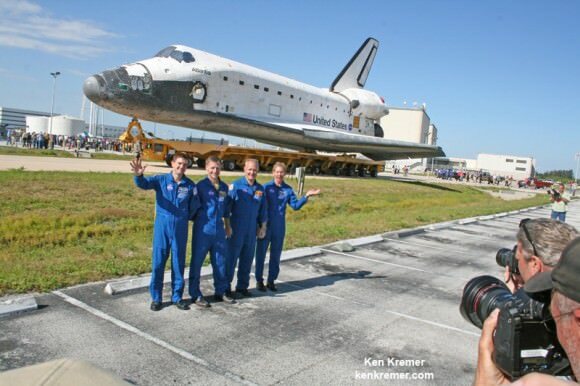 NASA’s final shuttle crew on STS-135 mission greets the media and shuttle workers during Atlantis rollover from the OPF-1 processing hanger to the VAB at KSC during May 2011. From left: Rex Walheim, Shuttle Commander Christopher Ferguson, Douglas Hurley and Sandra Magnus. 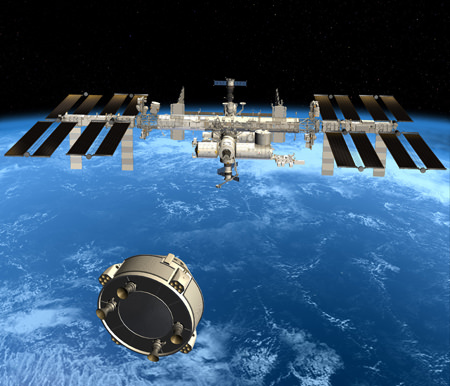 The all veteran crew delivered the Raffaello multipurpose logistics module (MPLM), science supplies, provisions and space parts to the International Space Station (ISS). Boeing’s design philosophy is straightforward; “It’s a simple ride up to and back from space,” Ferguson emphasized to me. Next we turned to the venerable Atlas V rocket that will launch Boeing’s proposed space taxi. But before it can launch people it must first be human rated, certified as safe and outfitted with an Emergency Detection System (EDS) to save astronauts lives in a split second in case of a sudden and catastrophic in-flight anomaly. United Launch Alliance (ULA) builds the two stage Atlas V and is responsible for human rating the vehicle which has a virtually unblemished launch record of boosting a wide array of advanced US military satellites and NASA’s precious one-of-a-kind robotic science explorers like Curiosity, JUNO, MAVEN and MMS on far flung interplanetary voyages of discovery. What modifications are required to man rate the Atlas V to launch humans on Boeing’s CST-100? “We will launch on an Atlas V that’s being retrofitted to meet NASA’s NPR human rating standards for redundancy and the required levels of fault tolerance,” Ferguson explained. The Atlas V is already highly reliable. The EDS is one of the few systems that had to be added for human flights? Does that require a lot of work? So it’s not a showstopper. Can ULA meet your 2017 launch schedule? “So we’ll see how ULA does building this,” Ferguson stated. The future of the CST-100 project hinges on whether NASA awards Boeing a contract to continue development and assembly work in the next round of funding (dubbed CCtCAP) from the agency’s Commercial Crew Program (CCP). The CCP seed money fosters development of a safe, reliable and new US commercial human spaceship to low Earth orbit as a public/private partnership. NASA’s announcement of the CCP contract winners is expected around late summer 2014. Based on my discussions with NASA officials, it seems likely that the agency could select at least two winners to move on – to spur competition and thereby innovation – from among the trio of American aerospace firms competing. Besides Boeing’s CST-100, the SpaceX Dragon and Sierra Nevada Dream Chaser vehicles are also in the running for the contract to restore America’s capability to fly humans to Earth orbit and the International Space Station (ISS) by 2017. In Part 3 we’ll discuss with Chris Ferguson the requirements for how many and who will fly aboard the CST-100 and much more. Be sure to read Part 1 here. KENNEDY SPACE CENTER, FL – Boeing expects to launch the first unmanned test flight of their commercial CST-100 manned ‘space taxi’ in “early 2017,” said Chris Ferguson, commander of NASA’s final shuttle flight in an exclusive one-on-one interview with Universe Today for an inside look at Boeing’s space efforts. Ferguson is now spearheading Boeing’s human spaceflight capsule project as director of Crew and Mission Operations. “The first unmanned orbital test flight is planned in January 2017 … and may go to the station,” Ferguson told me during a wide ranging, in depth discussion about a variety of human spaceflight topics and Boeing’s ambitious plans for their privately developed CST-100 human rated spaceship – with a little help from NASA. Boeing has reserved a launch slot at Cape Canaveral with United Launch Alliance (ULA), but the details are not yet public. If all goes well, the maiden CST-100 orbital test flight with humans would follow around mid-2017. “The first manned test could happen by the end of summer 2017 with a two person crew,” he said. Boeing is among a trio of American aerospace firms, including SpaceX and Sierra Nevada Corp, vying to restore America’s capability to fly humans to Earth orbit and the space station by late 2017, using seed money from NASA’s Commercial Crew Program (CCP) in a public/private partnership. The next round of contracts will be awarded by NASA about late summer 2014. That’s a feat that America hasn’t accomplished in nearly three years. “It’s been over 1000 days and counting since we landed [on STS-135],” Ferguson noted with some sadness as he checked the daily counter on his watch. He is a veteran of three space flights. 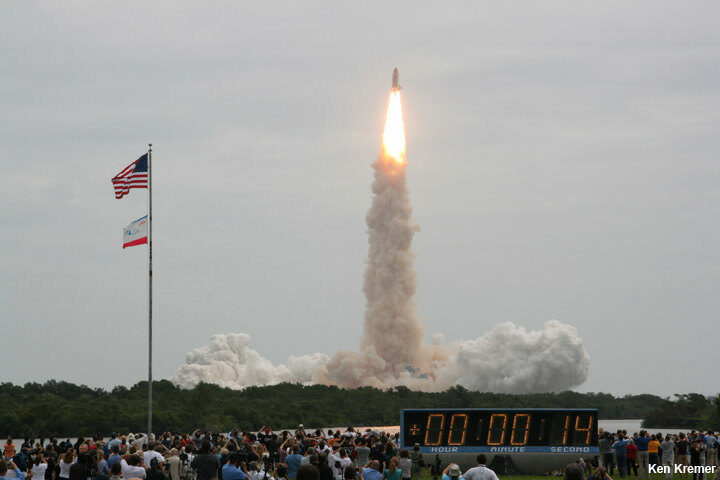 Since the shuttles retirement in July 2011 following touchdown of Space Shuttle Atlantis on the last shuttle flight (STS-135) with Ferguson in command, no American astronauts have launched to space from American soil on American rockets and spaceships. The only ticket to the ISS and back has been aboard the Russian Soyuz capsule. Chris and the Boeing team hope to change the situation soon. They are chomping at the bits to get Americas back into space from US soil and provide reliable and cost-effective US access to destinations in low Earth orbit like the ISS and the proposed private Bigelow space station. Boeing wants to send its new private spaceship all the way to the space station starting on the very first unmanned and manned test flights currently slated for 2017, according to Ferguson. The CST-100 will launch atop a man rated Atlas V rocket and carry a mix of cargo and up to seven crew members to the ISS. “So both the first unmanned and manned test flight will be in 2017. The first unmanned orbital flight test is currently set for January 2017. The first manned test could be end of summer 2017,” he stated. I asked Chris to outline the mission plans for both flights. “Originally it was just going to be an on orbital test of the systems, with perhaps a close approach to the space station. But we haven’t precluded our ability to dock. “So if our systems mature as we anticipate then we may go all the way and actually dock at station. We’re not sure yet,” he said. So I asked whether he thinks the CST-100 will also go dock at the ISS on the first manned test flight? “Yes. Absolutely. We want go to all the way to the space station,” Ferguson emphatically told me. “There are a lot of ways we have to make NASA and ourselves happy. But as a company we feel we can go do it,” Ferguson stated. So the future looks promising. But the schedule depends entirely on NASA funding levels approved by Congress. And that vital funding has been rather short on supply. It has already caused significant delays to the start of the space taxi missions for all three companies contending for NASA’s commercial crew contracts because of the significant slashes to the agency’s CCP budget request, year after year. In fact the schedule has slipped already 18 months to the right compared to barely a few years ago. So I asked Chris to discuss the CCP funding cuts and resulting postponements – which significantly affected schedules for Boeing, SpaceX and Sierra Nevada. “No Bucks, No Buck Rogers,” explained Ferguson. “So both flights are now a full year and a half later.” Ferguson confirmed. Now at this very moment Congress is deliberating NASA’s Fiscal 2015 budget. NASA Administrator Charles Bolden has said he will beg Congress to approve full funding for the commercial crew program this year – on his hands and knees if necessary. Otherwise there will be further delays to the start of the space taxi missions. And the direct consequence is NASA would be forced to continue buying US astronaut rides from the Russians at $70 Million per seat. All against the backdrop of Russian actions in the Ukraine where deadly clashes potentially threaten US access to the ISS in a worst case scenario if the ongoing events spin even further out of control and the West ratchets up economic sanctions against Russia. The CST-100 is designed to be a “simple ride up to and back from space,” Ferguson emphasized to me. It is being designed at Boeing’s Houston Product Support Center in Texas. In Part 2 of my interview, Chris Ferguson will discuss the details about the design, how and where the CST-100 capsule will be manufactured at a newly renovated, former space shuttle facility at NASA’s Kennedy Space Center in Florida. Could the Cassini Saturn mission get the axe? Wired’s Adam Mann warns that NASA may not be able to fund all of its planetary science missions in the coming year. Based on a statement that Jim Green, NASA’s planetary science director, made to an agency advisory council earlier this month, Mann narrows in on the Curiosity and Cassini missions as the big flagship missions that are requiring the most in terms of resources. Cassini is functioning perfectly and providing reams of data from Saturn and its moons, causing concern from planetary scientists about losing it early. Only one commercial crew partner? NASA issued a cautious news release this week saying it is prepared to launch Americans from their own soil in 2017, “subject to the availability of adequate funding.” The agency is now moving into a new phase of its commercial crew program called Commercial Crew Transportation Capability (CCtCap), saying it is prepared to “award one or more CCtCap contracts no later than September 2014.” That means that the three companies currently funded — Boeing Co., Sierra Nevada Corp. and SpaceX — may face stiff competition for more money. New report suggesting stopping NASA’s human spaceflight program: Before reading any further, do not jump to conclusions — making recommendations like this is a common practice by the Congressional Budget Office, which looks at all possibilities as it presents options for spending. Still, Space Politics’ Jeff Foust presents the report and generates some interesting comments after his story about the value of human spaceflight. For context, NASA and its international agency partners will need to make a decision fairly soon about continuing space station operations past 2020, so it’s possible the human spaceflight program could change. What do you think of these proposals? Let us know in the comments.